The Shortlist is the report that is available to all registered users on Tuesday, and Sussex Girl makes it on to there today in a ten-furlong handicap at Brighton. He has a good score of 13, having four section of green and one of amber, so looks particularly well suited to this race. It is an open looking handicap and she is currently priced around 7/2. Sussex Girl won her last two races of last season, both over ten furlongs and on ground with soft in the description, and comes here with a three pound higher mark for that final win. One of those two wins was here at Brighton and if she is fit after a winter break, looks sure to run a big race. Trainer John Berry appears to enjoy sending his horses to Brighton as he has an excellent long-term record here. Over the past five years, he's had eight winners (33.33%) and 13 places (54.17%) from 24 runners, for level stakes profits of 33.00 and 41.61 respectively and an Impact Value of 2.54. He also has an impressive record with last time out winners. From his last 16 such runners, he's had seven winners (43.75%) and 13 places (81.25%), for level stakes profits of 15.98 and 24.23 and an Impact Value of 2.32. The Instant Expert report highlights how well suited Sussex Girl is to these conditions and shows that the rest of the field does not appear well suited at all. Apart from Sussex Girl, there are only two other horses in the field that have a section of green each. 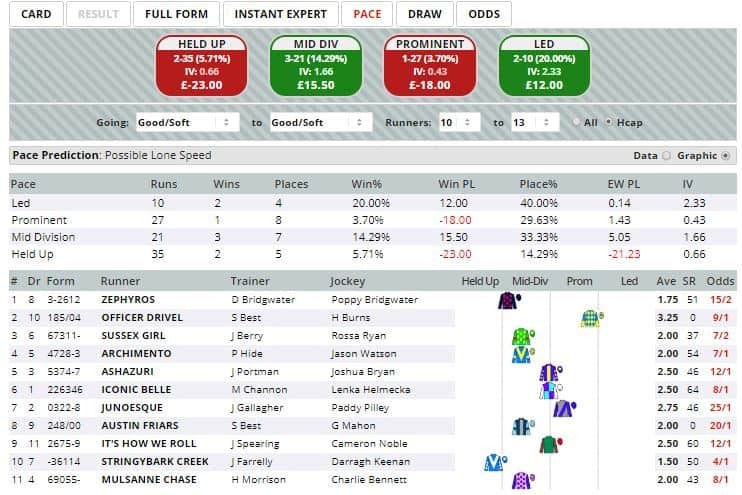 The Pace report shows that early leaders here over this distance have the best record, with 20% of them going on to win the race, for a level stakes profit of 12.00 and an Impact Value of 2.33. Sussex Girl raced close to the pace last time out and I expect Ryan to adopt similar tactics in this one to ensure he is in a good position to strike when they enter the final quarter of a mile. Click here for the 17:25 at Brighton.